clutter clearing | Getting to Less: Downsize! Downsizing my closet, with help. My well-dressed and ruthlessly honest friend Judi came over this morning to help me tackle that which I’ve been unable to tackle alone… my closet. I thought I’d done so well this summer when I filled two large bags for Goodwill. But when I thought about squeezing my clothes into a couple of suitcases and a wardrobe box, it was clear a radical clothesectomy was required. Mostly I dress very casually because I work from home. When I’m not at my desk I’m pulling weeds in the yard or muscles at yoga. 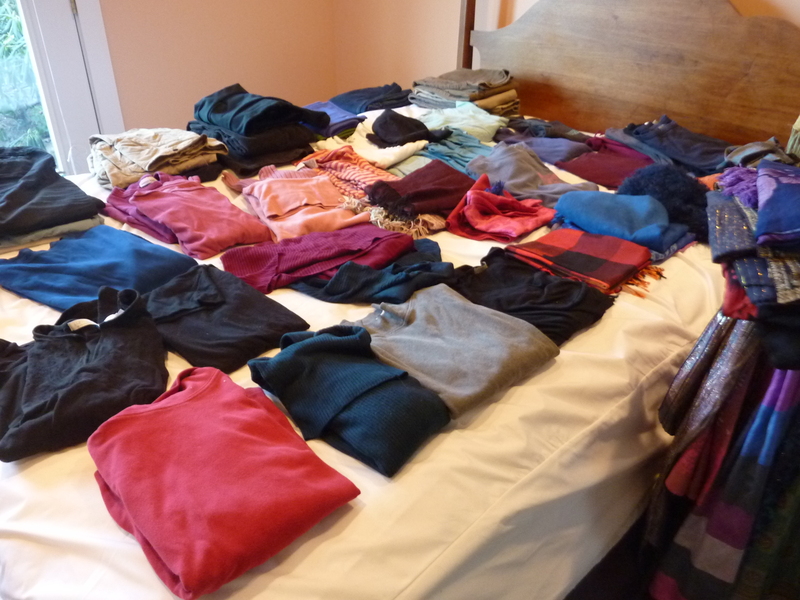 But I do like color, so I’ve got sweaters, tops and scarves in a rainbow of colors that look good on me. Some have the patina of age on them. Some were good ideas worn once. Judi hauled them all out of the closet and arranged them by color in stacks on the bed. It became clear that I had an over-abundance of tops in certain colors, and an over-abundance of tops with round t-shirt necks which I recently decided are extremely unflattering on a person with an older shorter wrinkled neck. Not naming names. We imagine a time in the future when we’ll need or want them. Since I rarely spend much on an article of clothing #1 isn’t a real problem for me. Nor is #2 (at least in terms of clothes… we’re not going to talk about books, photos, art, vases, paper… ). My problem is #3 – imagining the future. Unlike so many I’m not hanging on to a wardrobe in four different sizes, because I’ve been a size 6 for decades. But I do imagine a future in which that shade of purple will come back, that shape jacket, that style of bell-bottoms. I imagine a future in which I will be invited to a costume party, a rodeo, the Black and White Ball, a hike in the Arctic, and dinner with Barack Obama. Judi disabused me of all those fantasies, and long story short, we filled three LARGE trash bags with Goodwill material. Whenever I faltered, she had me try the thing on and look in the mirror. If the mirror didn’t convince me, the look on her face did. What was left will indeed fit into 2 suitcases and a wardrobe box. A personal triumph. It will be easier to choose what to wear and I bet none will be missed. The story goes that Michelangelo carved the beautiful statue of David from a single piece of marble, chipping away all that was NOT David until David emerged, freed from the stone. Whether the story is true or apocryphal is less important than the inspiration it provides those of us who are downsizing. All you have to do is let go of that which is not the current you, and VOILA! the new free you is born. It sounds so simple and obvious, when put like that. And it’s so much more challenging in practice. I once had a feng shui client whose adolescent daughter was ADHD, depressed and anxious. When I visited their home I could see why (quite apart from any underlying biological issues). The family had STUFF everywhere. You couldn’t sit in the living room without having to push 3 teddy bears off a chair. And the girl’s room had so many playthings that you couldn’t walk across the room without tripping on something. The wife was a nervous wreck, and the marriage was going badly. The client had a good reason for wanting to keep each thing. Finally I suggested that the family try an emergency intervention: a vacation from their stuff. This meant renting an unfurnished place in the neighborhood and moving over there with only the most essential things they needed to conduct their lives – beds, sheets, chairs, table, pots and pans, hair dryer, a couple weeks worth of clothes. They weren’t to return to their home for at least a month. Once their nervous systems calmed down they could go back and retrieve no more than a few things each per week. After a couple of months of that they were to hire someone to help them offload about 75% of what remained in the house. Then they could move back home. Of course they didn’t take my advice, but if you’ve ever gone on a month’s camping trip or other rustic vacation, you know exactly how freeing it feels to have almost nothing. You make do. You’re free to be yourself, to change directions at any moment, to fly. If I had sufficient funds to maintain two places, I’d love to engineer my pare-down process that way. Move to a new place taking only the essentials and moving other stuff gradually. Thus detached, it would be so much easier to let that stuff go…. And then VOILA! Joy would emerge. Unfettered. Possessed by possessions: are you the owner or the owned? So you do the google hunt, find the best price, type out your credit card number and drag that sucker home. You wear, sit on, look at, or labor-save with the new possession, feeling quite smug about your excellent taste. Your friends may even envy you a little for getting this new possession. Time passes. More gizmos and whatchamacallits enter your life. Some of them break. You get bored with others. One day you wake up and realize you’ve been possessed. Your possessions have taken over your life and now they own you! You’re exhausted trying to keep them dusted, repaired, organized, and their batteries charged. You’ve lost crucial parts, operating manuals. And who are those people with granny glasses and bell-bottom trousers in the yellowing photographs? You can’t find the one thing you really need. Then the kids leave home, your retirement fund collapses and you need to make some major adjustments to your lifestyle. Bye bye acquiring, hello downsizing. Even though I live relatively clutter-free, I’ll be rattling around a 3,000 sq. ft house alone when my last child leaves next month. I can no longer afford to maintain a place this big – and indeed, even if I could afford to, I don’t want to be tied down by so much stuff, so much responsibility. I want to take back my life from my possessions. Which means that HALF my possessions need to GO. If you’ve done this or are doing this, let me hear from you!Advice, moral support and tips from your own experience always welcome. Maybe you’ve got ideas about selling art? antiques? Dealing with boxes of photos, big honking scrapbooks. Plenitude: abundance, copiousness; the condition of being full, complete. From Latin: plenus = full. Whenever you’re feeling cranky, mingy and stingy, like you just don’t have ENOUGH (enough whatever – money, love, time), the pop psychology wisdom is to open your heart to the gifts you already have and to feel gratitude for the bounty in your life. And I do that. I feel grateful for the abundance in my life most of the time. I am satisfied and want not. However. Plenitude is not necessarily all it’s cracked up to be. I’ve got TOO MUCH of a good thing. Too much of MANY good things. Too big a house. Too big a (beautiful) garden. Too many books. Too many interests. Too many commitments. My life is plenus to the max. Though you can never have too many friends. A feng shui colleague of mine suggests that if you want something new in your life (new career, partner, social circle, home) you have to go beyond ordinary clutter clearing. You have to create a VACUUM. Only when there’s a nice big hole will something rush in to fill it. Here’s the experiment: after I jettison half my stuff and find a place half as big as my current home, what other opportunities will appear? And if I’d complete my divorce and stop being friends with my ex, will a new romance appear? Impermanence: n. an essential element of Buddhism – that everything is changing, inconstant, in flux. Because things are impermanent, attachment to them is futile, and leads to suffering. The Portland area was blanketed in nearly a foot of snow for most of the week up until Christmas. My California grandkids were thrilled to share a white Christmas with their two super-fun uncles, who are young at heart at 25 and 37. And now the family is gone and house is totally quiet again. The holiday disappeared as quickly as the snow, and I feel a lot like our snowman. Quite deflated and a little soggy. Six of the seven boxes were Ethan’s. To keep him company I brought out a couple of boxes of my own papers for sorting. I have to hand it to him; he carefully plowed through a couple of boxes every day, examining each item (artwork, book reports, photos and letters), recycling about half of it, but savoring and repacking the rest to ship to California where he lives. My own journals and letters are voluminous – going back to college! The triviality of most of my concerns appalls me, but it’s all there – bringing the past temporarily back to life. The process was a powerful reminder of how many lives we each have lived through, in what seems like the blink of an eye. Friends, passions, projects… developing, ripening, disappearing. Many forgotten until a picture or letter brings it back. We keep these things because our memories are as ephemeral as our poor melted snowman. Books are among the things I need to winnow out in this down-sizing project. So a couple of days ago I made a pilgrimage to Powells with three boxes of books I hoped they’d want. The door to the book-buying room is on a very busy corner and it’s not always possible to park close by, so my son met me at the door and hauled the boxes in while I went to park. This is my very manly 25-year-old son talking, not a nine-year-old. Sigh. Nevertheless Powell’s bought about half of what I brought and gave me a decent amount of money for them. Immediately we got lost in the aisles, and the money would have gotten spent in a trice if we hadn’t had to be someplace else. As book-lovers (as well as book-sellers) we both agreed that a it would be heavenly just to spend the entire day at Powells, getting lost in the stacks. Parigraha: n. ancient Sanskrit word meaning grasping, hoarding, holding onto one’s stuff. Sooner or later – and the way the economy and my savings are going right now it’s looking like a lot sooner – I’m going to have to sell my house and move into much smaller quarters. 1) A home that is sparsely furnished shows better when it goes on the market because prospective buyers have enough open space that they can imagine themselves and their stuff in it. 2) My future home, which will be about half the size of this one, can comfortably fit only half as much stuff – if that much, maybe less. In yoga, we study the yamas and niyamas, which are about how we want to be in the world as compassionate enlightened yogis. Patanjali wrote them down about 150 BCE (!) as part of the Yoga Sutras. They’re kind of like rules of conduct – not rigid or dogmatic – but more like ideal states of being to continuously work towards. The fifth yama is aparigraha (the opposite of parigraha) or non-grasping, non-hoarding. Ideally we yogis are not attached to our stuff. It flows in and out of our lives – we use it and let it go, use it and let it go. Ideally. But our stuff means so much to us! It is SPECIAL stuff. Even if it stands in the way of emotional and physical freedom, we clutch it close. My current spiritual practice involves gathering the equivalent of a box of stuff every day – either for disposal (recycling LOTS of paper right now), re-use (Goodwill, here I come), or sale. I’m starting with easy stuff – a couple of days ago it was ancient computer manuals, old tax papers and receipts. I’ve got boxes and boxes and file drawers and file drawers more paper to go. Not wanting to overwhelm my recycle pickup service I switched yesterday to culling socks, stockings and tights. Today is table linens. I have an amazing number of napkins that I never use because they clash with my dinner dishes, or are stained, or are insufficient (why is it I buy a set of SIX napkins, when I rarely feed less than EIGHT for a company dinner??). I know I’ll have to make much deeper cuts in every department, but I’ll use the easy stuff like mental weight-lifting, to strengthen my resolve. The hardest will be stuff that I equate with memories – of a special person, place or time. Down the road.